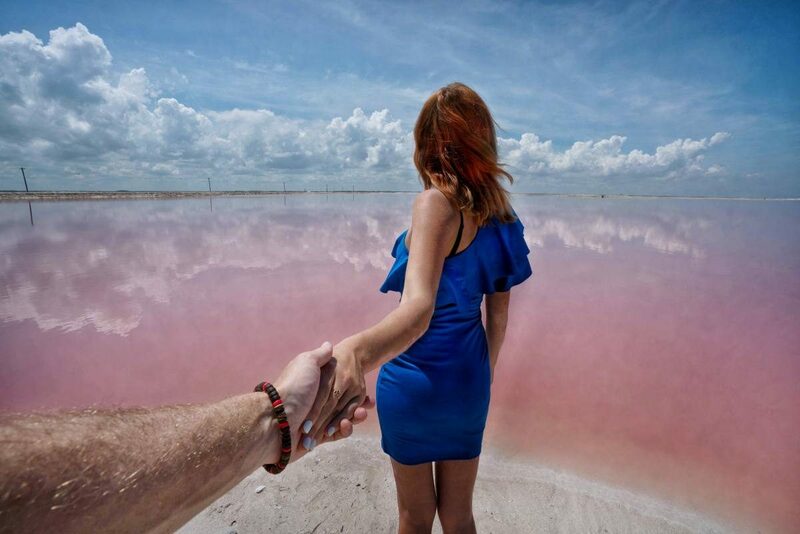 Pink Lakes of Las Coloradas in Yucatan is a real place with pink water. A photo from this location also became my most shared and popular photo on Instagram, so it comes as no surprise that many readers and followers are asking me questions about it. 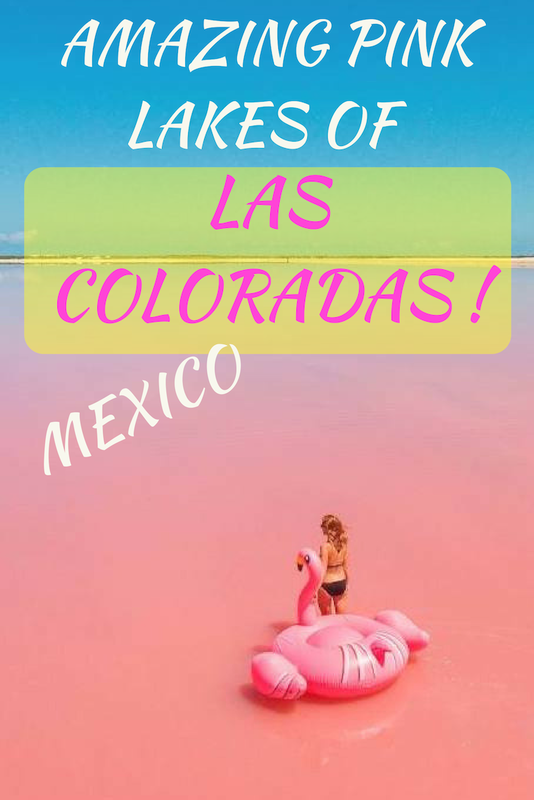 Here’s a basic compendium of everything you need to know when visiting Las Coloradas that some refer to pink lakes, others to pink lagoons. Las Coloradas means ‘blush red’ in Spanish. It’s actually the name of a tiny village, that specializes in salt production and fishing. 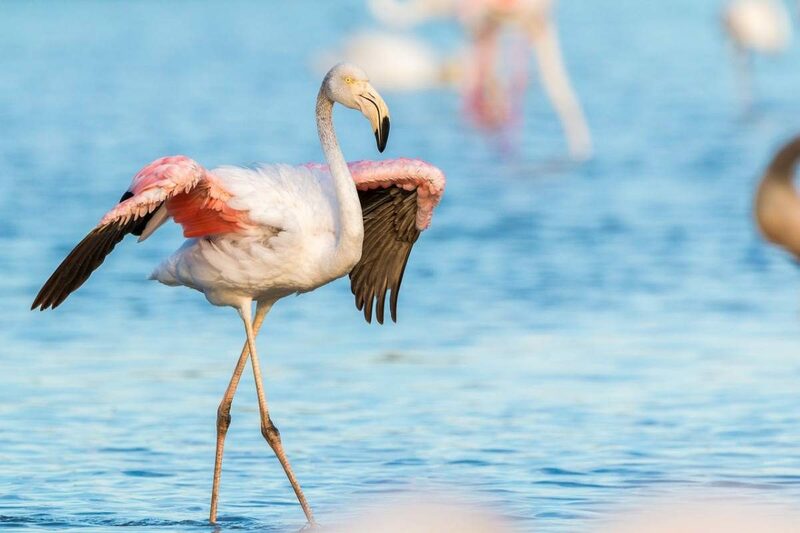 The place is a part Rio Lagartos Biosphere, protected Natural Reserve with many birds, crocodiles, flamingos and other species. No matter where you’re coming from, it’ll probably take you about 5-6 hours round trip just to get there. Is it actually worth your time…? I’m not going to lie. When I first visited Las Coloradas I ended up coming back very disappointed. I took a tour that promised to take me to see pink lakes, a river full of crocodiles and ruins of Ek Balam. However, I ended up seeing a small body of water that looked more yellow than pink, no crocodiles or flamingos, and I didn’t understand how did some people claim to see bright pink lakes. The trip was a big fail. 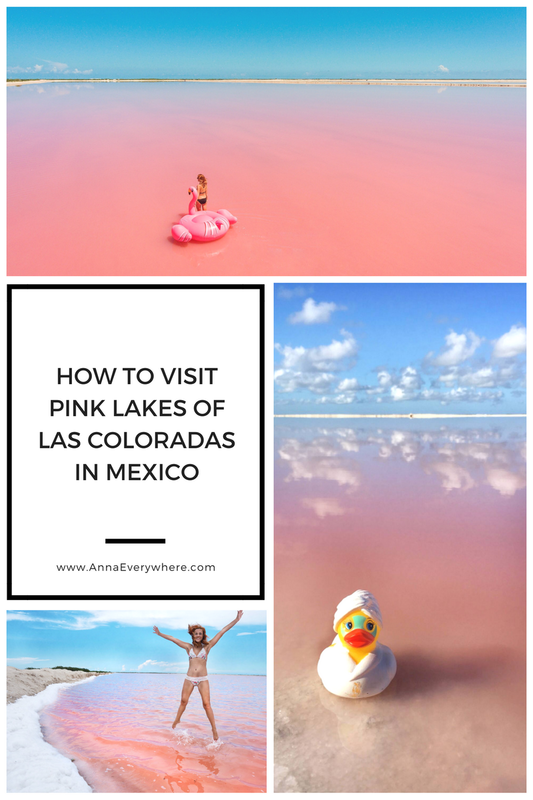 When I came back to Las Coloradas and Rio Lagartos for the second time in a rental car, my husband and I found our way to the actual pink lakes. Here are my tips on how to arrange your trip in order not to get disappointed. What to do in Las Coloradas? Is the pink water natural? Can you swim in pink lakes? Can you visit Las Coloradas without a car? 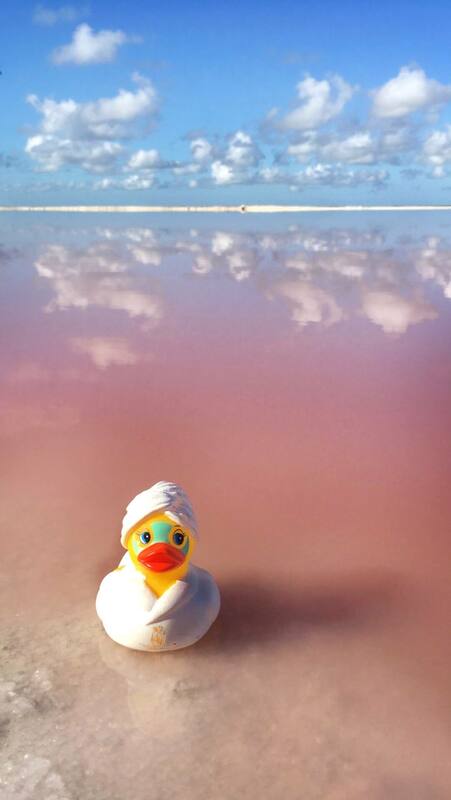 Are there any tours to Las Coloradas? Where to Stay near Las Coloradas? There’s not much to do at pink lakes apart from admiring their beauty. Las Coloradas is a very small town, so you won’t find any tourist attractions like souvenir shops, cafes etc. At least, not yet, but judging from the crowds storming the place it might happen soon. In fact, there’s only one local restaurant there and some very basic corner stores. It’s also important to mention that pink lakes aren’t technically a tourist attraction per se. 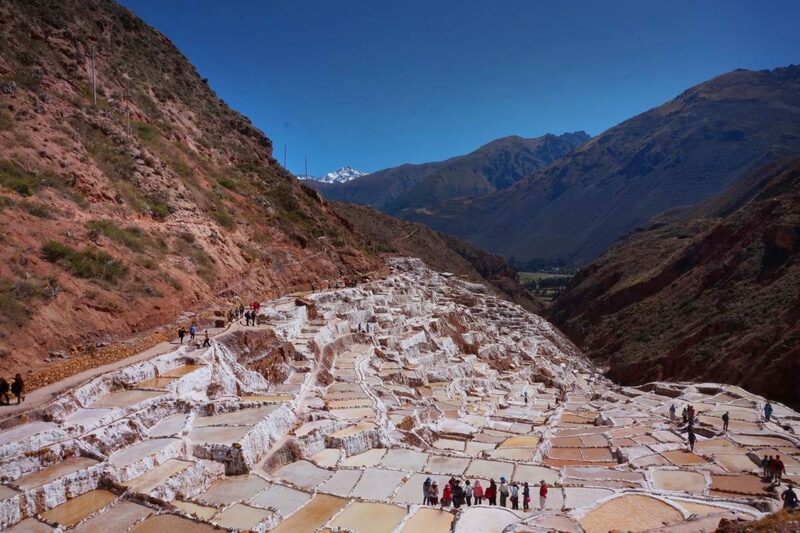 It’s a working salt factory that became famous for the pink color of the water that locals don’t want to turn into a tourist attraction like it happened to Salinas de Maras in Peru. 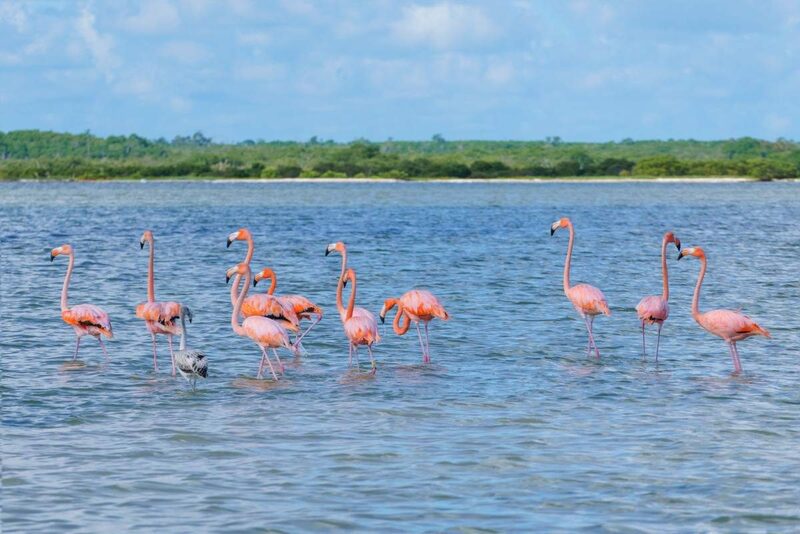 If you’re heading to Las Coloradas, I suggest you also take a boat tour around the nearby biosphere of Rio Lagartos. In order to do so, just walk down the main road by the water of Rio Lagartos town (located about 30 minutes from Las Coloradas), where the boats are kept. You will be approached by several boat owners offering to take you into the reserve. Boat tours coast about 900 MXN per boat (not per person) and they’ll take you to see birds, horseshoe crabs, plenty of flamingos, and crocodiles. You’ll have an opportunity to bathe in salt water and take a mudbath. Apparently, a mud bath is very good for your skin and the same mud costs a lot if bought in a fancy box. My personal tip would be to go see the lakes AND take a boat tour. The boat tour is totally worth it, but you won’t see the pink lakes up close from it. Why Are Las Coloradas Pink? Is the Pink Water Natural? I’d say that the place is 50% natural and 50% manmade. Back in the Mayan times, salty ocean water from mangroves was flooding to manmade lagoons and evaporating in the sun, leaving natural sea salt behind. 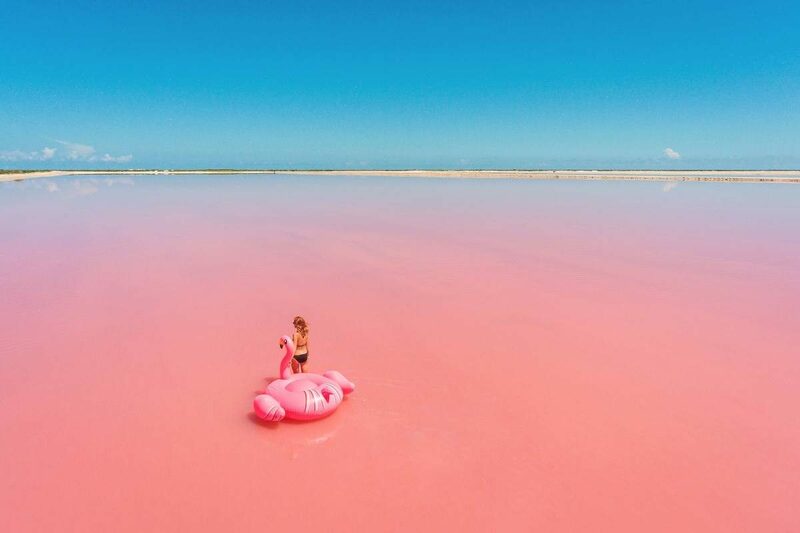 Since the lagoons are so shallow and salty, the red algae and plankton are brine shrimp are concentrated and as a result, their pink color makes the water pink. Sorry to disappoint everyone, but you cannot swim in pink lakes anymore. More than half of the lakes of Las Coloradas are privately owned and fenced, so you can’t trespass. Back when these lakes weren’t as popular as they are now (thank Instagram for that! ), there were some that you could get into as they weren’t used for salt production. These days it’s all guarded by security and you can’t really even touch the water. Guards on motorcycles are seriously everywhere now and they will stop you immediately. The good news is that you haven’t missed much! The lakes are VERY shallow and water level gets to your knees the most. The water is super salty, so your skin gets dry and disgusting, some even claimed to have burnt their skin. On the plus side, on your way to Las Coloradas you will pass an entire coast of beautiful white sand beaches. I’m not going to lie and say that getting to Las Coloradas takes a long time. No matter where you’re coming from – Cancun, Merida, Playa del Carmen, Tulum, Las Coloradas is at least 2-3 hours away. The road leads through small towns and there are NO gas stations between Playa and Valladolid, so fill your tank beforehand! 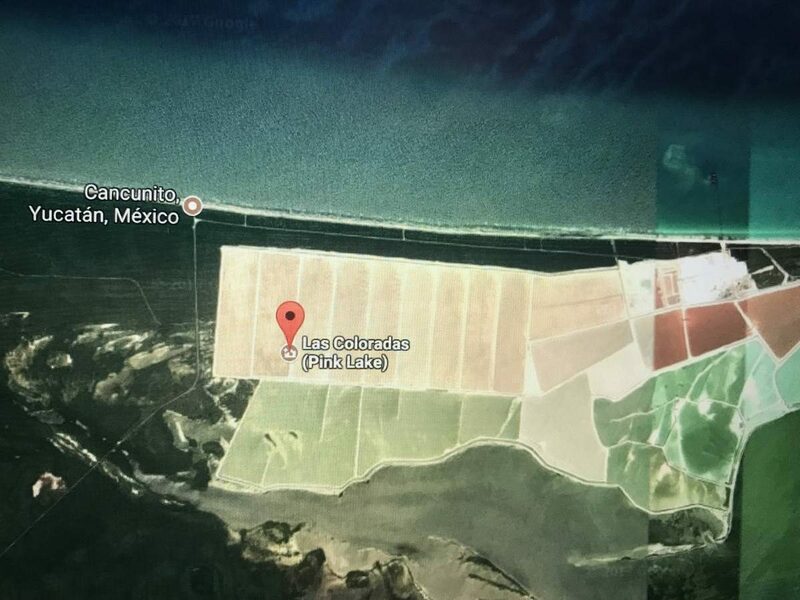 You can use Google Maps to point you to “Pink Lake Las Coloradas”. You can, BUT it takes a long time and costs a lot of money if you want to do it on your own. While there are buses to Rio Lagartos, they aren’t frequent and if you’re coming from Tulum, Playa del Carmen or Cancun, it’ll take forever. There aren’t many taxis in Rio Lagartos and none in Las Coloradas, so you’ll also have to find and hire someone to stay with you while you see the lakes. It’s usually not cheap. There are tourist buses coming to see the lakes, and they also doug a moat around some lakes so people won’t come close to the water anymore, you can find some shuttles easier than it used to be. Some people were asked for money to be able to see the lakes, but they’re absolutely free to visit as of now. Since the lake became popular several tour companies launched tours to Las Coloradas. The majority of tours go to Rio Lagartos for the biosphere boat tour and proceed to the main viewing point of pink lakes. When choosing the tour remember to make sure that the tour goes to the main viewing point for Las Coloradas on top of the boat tour, or you’ll end up disappointed. You can’t see the actual pink lakes up close from the boat. It’s the most well-known and luxurious hotel in the area. While I haven’t stayed there myself, I ate dinner at their restaurant and can vouch for the good food. Affordable hotel with regular facilities. Everything was just as described with no surprises. My husband and I had a great experience. 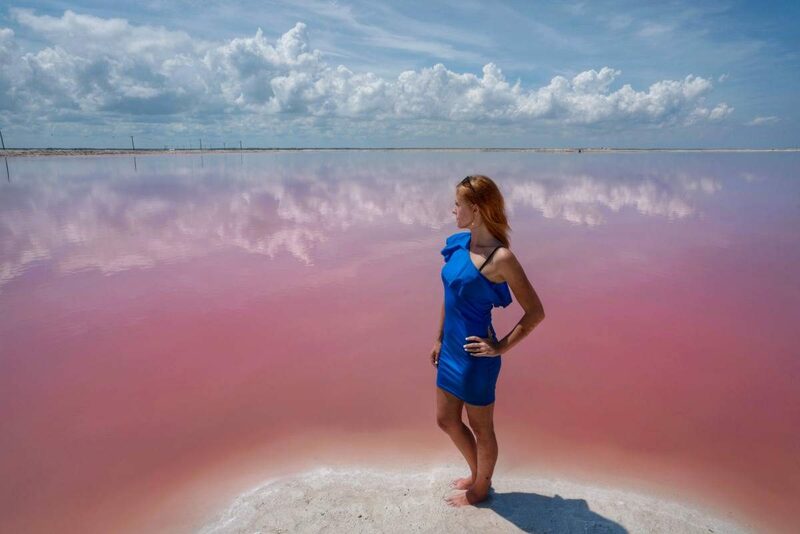 Is a visit to Las Coloradas Pink Lakes actually worth the trip? In my personal opinion, Las Coloradas pink lakes are totally worth the effort if you have enough time to visit and keep in mind that it is a working salt factory. If you love nature, you’ll enjoy a boat trip through the natural reserve. While you can’t do much with the pink lakes, it’s a great natural thing to see and admire. During this day trip, you can also visit some of the nearby beaches completely free of tourists. Another option for an add-on to your trip would be stopping by a town of Izamal, also known as the yellow town, if you want to see more colorful places. Mexico: Travel & Live section! 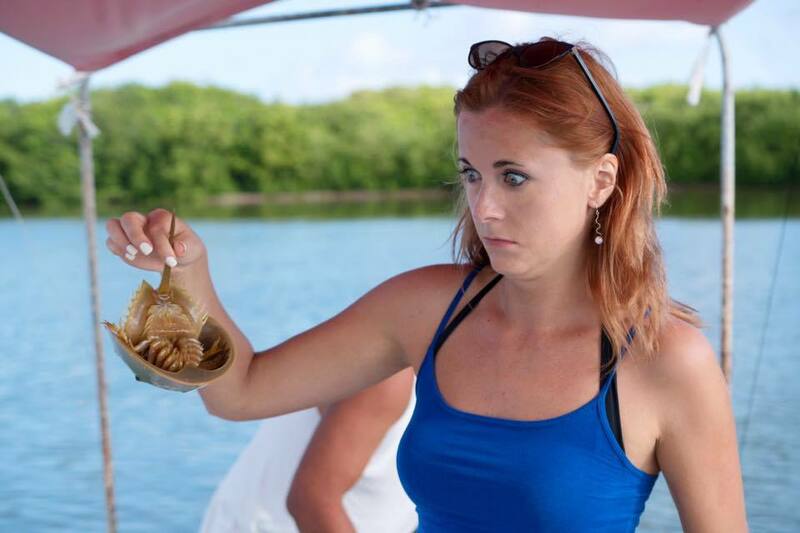 If you have any specific questions join my Mexico Travel Tips community group on Facebook. Don’t forget to arrange a health insurance before heading to Mexico. The easiest and the most reliable travel insurance is World Nomads Travel Insurance. Get it before your trip to skip unnecessary troubles that might ruin your holidays! Any questions? Ask me in the comments!